On September 15th Microsoft has released Exchange Server 2013 CU10. Cumulative Update 10 contains the latest set of fixes and builds upon Exchange Server 2013 Cumulative Update 9. As a reminder CU releases are full Microsoft Exchange products allowing new installations. Cumulative Update 10 is the minimum version of Exchange Server 2013 which will co-exist with Exchange Server 2016. Microsoft Exchange 2013 Cumulative Update can be downloaded directly from Microsoft. Please keep in mind this CU requires some Active Directory Schema changes hence proper permissions are required (check notes section). 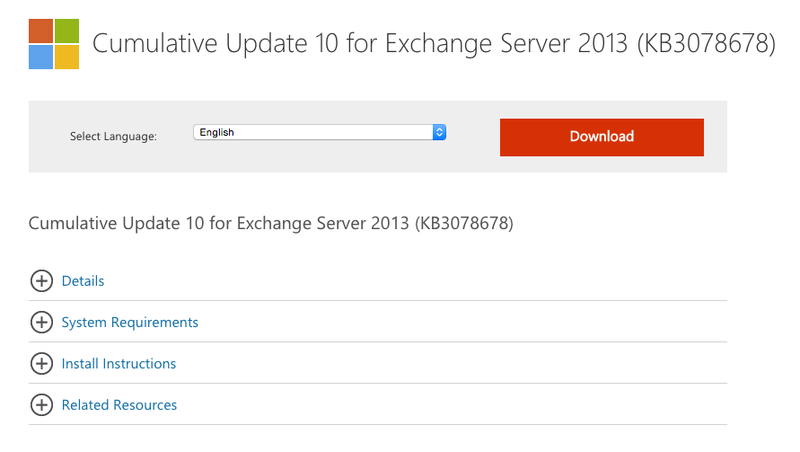 Full release notes can be found on TechNet – Release notes for Exchange 2013 CU10. As always it's highly advised to either wait a bit for reports about potential issues on new release deployment or do it in test environment first. The Cumulative Update 10 package can be used to perform a new installation of Exchange Server 2013 or to upgrade an existing Exchange Server 2013 installation to Cumulative Update 10. You don't have to install Cumulative Update 1 or a later cumulative update for Exchange Server 2013 when you install Cumulative Update 10.